Former minor leaguer Mark Young praised his nephew Eddie Young in 2008 as the younger Young headed to college, according to The San Diego Union-Tribune. "Having played the game for as long as I did, I can tell he's a genuine prospect," Mark Young told The Union-Tribune of his nephew. "He has the makeup to play the game every day." Mark Young spoke with the experience of five seasons spent in the pros. He made AA, but didn't make it higher. Mark Young's career began in 1987, taken by the Blue Jays in the 16th round of the draft out of the University of California-Riverside. At Riverside, Young led a double steal before scoring in a March 1986 game. He then homered in an April game. He hit .358 that season, with 21 steals as he won all-conference honors. He started with the Blue Jays between short-season St. Catharines and rookie Medicine Hat. He hit .314 in 32 games. 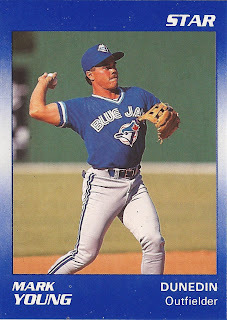 Young moved to single-A Myrtle Beach and Dunedin for 1988. He hit .239 there in 69 games. He scored 94 times at Myrtle Beach in 1989, good for fifth in the league. He hit .274 overall. He played 1990 at Dunedin, then 1991 at AA Knoxville. He hit .233 in 109 games at Knoxville to end his career. Young took a new career by 2008 as a radiation physicist. His nephew went on to UC Riverside like his uncle and made three seasons in independent ball.